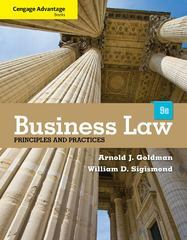 Cengage Advantage Books: Business Law: Principles and Practices 9 Edition BUSINESS LAW: PRINCIPLES AND PRACTICES, 9E has been revised dramatically to enhance learning! The 9th edition offers a new learning system with clear learning objectives to guide students. The fresh two-color design engages students with its contemporary features: Ethics in a Business Setting, You React, and the Self-Check Quizzes. The case examples are presented in readable segments to be clear, current, and jargon-free. Co-authored by Arnold J. Goldman, a practicing attorney and William D. Sigismond, a veteran business law educator, this straightforward text shows students about the law using fascinating cases and ethical dilemmas. Hypothetical examples immediately follow discussion of concepts to further reinforce understanding. The new edition is updated throughout to reflect recent changes in the law, covering legal rights and responsibilities in both the public and private sectors.